My iTunes is Running So Slow (Windows 10/8/7)? Fixed! There are lots of iTunes users complain iTunes is running so slow even after updating to the latest version. If you are in the same situation, try these solutions to well fix your iTunes launching or loading slow issue. iTunes produces a great amount of useless files, junk files, etc. When being used. Those junk files not only takes up space but also slow down iTunes performance. 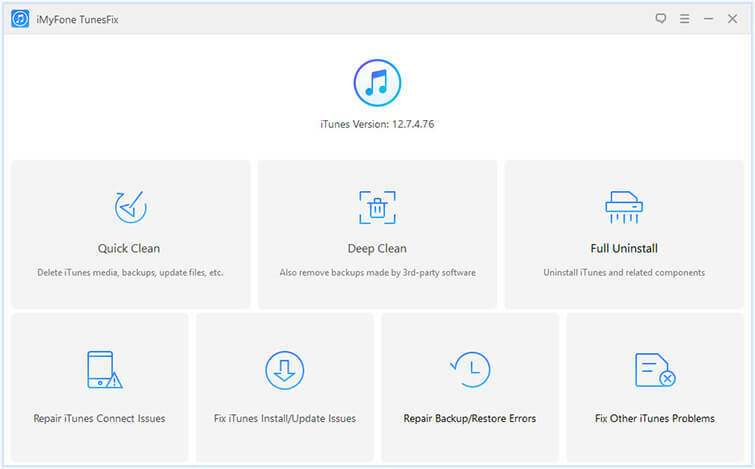 You can uninstall iTunes to remove the useless files, or you can take advantage of iMyFone TunesFix iTunes Cleaner to remove useless files from iTunes without uninstallation. Also delete iTunes media, like music, movies, tones, podcasts, etc., if you need. Fix all iTunes errors and issues in one place, without data loss. 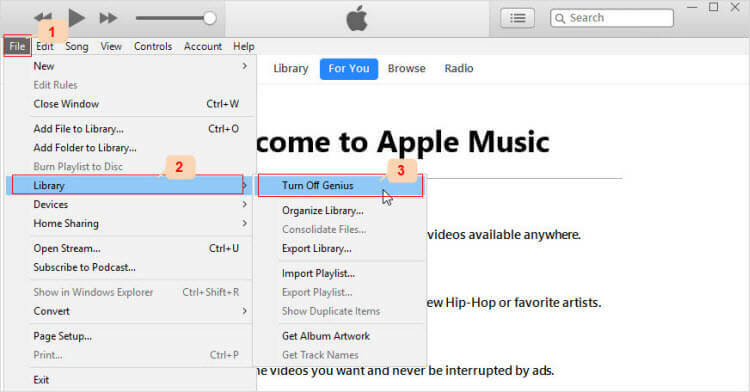 Step 1: Open TunesFix on your PC, and it will automatically detect your iTunes. Then it will guide you to its home interface. Note: If it shows your iTunes is damaged, click “Repair” to maintain your iTunes first. Step 2: Choose “Quick Clean” mode from the interface. Click “Scan” and it will start to analyzing your iTunes. 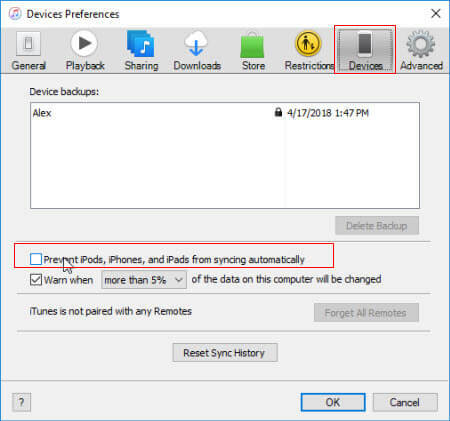 Step 3: At the end of the scan, it will show you 4 types of files stored with your iTunes: iTunes Media, iOS Backups, Software Update Files and Other Data. All the useless files are divided into the “Other Data” category. You can double-click on each file type to view more details and check useless files you want to clean. Click “Clean” to start the process. Just wait for a moment. It runs very fast for cleaning. Tap Devices. Check "Prevent iPod, iPhone, and iPads from syncing automatically". Click OK to save the settings. iOS backups eat up so much space, which will cause iTunes running slow. It’s time to remove some old backups from iTunes. By default, you can access the backups in “C:\Users\username\AppData\Roaming\Apple Computer\MobileSync\Backup”. But 3rd-party software would produce hidden backups which may store everywhere on your PC. Besides, even though you access the backups, you have no idea which backups you want to delete because the backup name is very strange. To bypass these troubles, you can directly take advantage of iMyFone TunesFix’s “Cleaning Feature”. 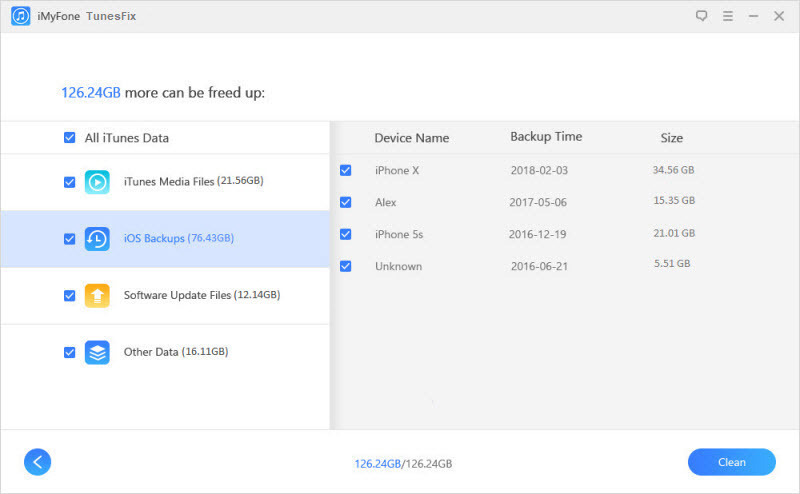 It shows you the backup with “Device Name” and “Backup Time” so you can easily recognize each backup. What’s more, it scans and deletes iOS backups made by iTunes and also by third-party software. Step 1: Open TunesFix on your PC. 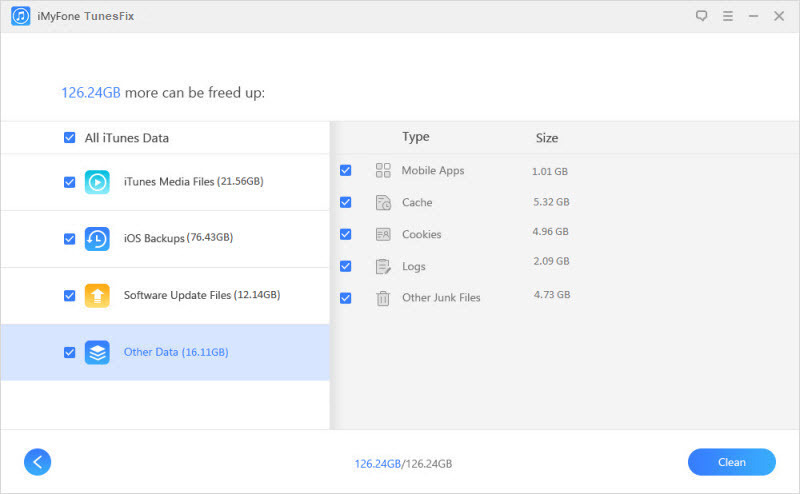 When you are in the home interface, choose “Quick Clean” (or “Deep Clean” if you also want to remove backups made by 3rd-party software) and let it scan. Step 2: When it’s done, double-click on iOS Backups and it will show you all the backups at the right panel. Step 3: Check the unwanted old iOS backups and click “Clean” to starting deleting. For iTunes to meet and exceed your expectations, it generates smart playlists, which occupies lots of system storage resources. 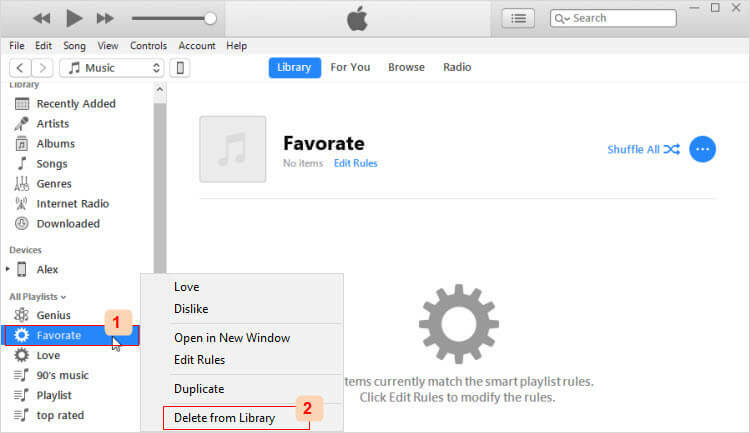 Removing used smart playlists can accelerate iTunes speed on your PC. Launch iTunes and right-click on a smart playlist. Select “Delete from Library”. Repeat this process on each smart playlist you would like to remove. iTunes Genius feature helps you to discover more music, and to compares your playlists with that of other music lovers. This also uses many resources which slows iTunes down. 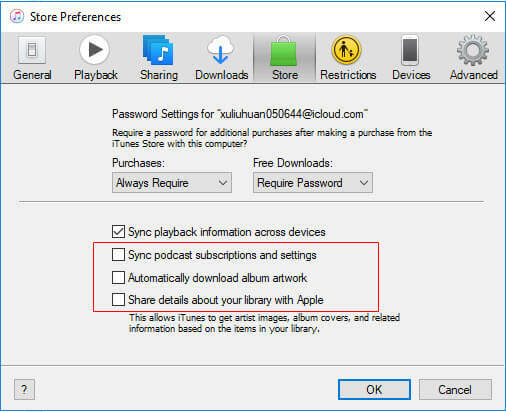 Disabling this feature can help to speed up a slow running iTunes. Go to “File > Library > Turn Off Genius”. There are so many services that flood iTunes but in an actual sense can be termed “Not in Use”. Some of them include: Podcast subscription, playback information, share my library, etc. you can disable this unnecessary service to speed up your iTunes. Launch iTunes and click “Edit > Preference > Store". Automatic download commence in iTunes the moment when your PC is connected to the internet. But you can stop this setting to speed up your iTunes performance. Launch iTunes and click "Edit > Preference > Store". 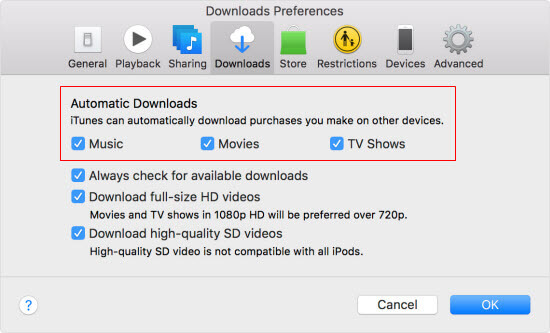 Uncheck options under Automatic Download, like Music, TV Shows and Movies. While navigating different features in iTunes, you’ll come across many notifications with a footnote “Do not ask me again”. These notifications can make iTunes run slower, and the speed of iTunes can improve when you check the box next to the message to stop receiving them.